Please forgive the dearth of information in the last few days. We have been quite overwhelmed by the reception given to us and our car. Approximately 550 Heleys have arrived in the Horizon Casino Hotel carpark. The organisers have been worried as to how so many people could be handled but so far it has all gone remarkably well. On Monday there was the popular choice judging day. All the cars were lined up in 20 different classes at a local school's running track. We were put in the 'Specials ' class along with some cars with proven race history and unusual stories. The awards were given out on Tuesday evening and we were thrilled to receive first place in our class. Everyone is keen to hear the stories of the Around the World Rally. We stood out by the car from 8.00 a.m. to 3 p.m. My, it got hot, but it was worth it. 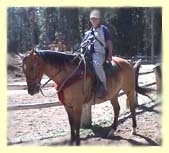 Tuesday Peter had to get an oil change and check some gauges so Kathryn and I went off for a trail ride on horseback, a change from four wheels under you. Very relaxing and beautiful scenery. Wednesday was the day at the racetrack. We both tested our skills on the autocross. We still await our final positions, but Peter was faster than me. Thursday we take a trip round the Lake on our own and miss on the organised tour. We have to get the rental car back to Reno and pick up another for Kathryn and Philip to take on the return trip to Baltimore. We do a car swop on the way back to Tahoe, daughter and Philip take over the hot Healey and I sit in the lap of air-conditioned luxury for the short return drive. Wednesday evening Peter and I give our Presentation on 'Around the World in 80 Days' with 180 slides by Power-point projector. It goes extremely well with loads of technical questions for Peter. The big ballroom was full to overflowing with our car and David Stonely's on the stage. I have never spoken to so many people before, very exciting as we were talking to such an interested audience. After a wonderful week the Conclave is over and we head off with Philip and Kathryn to San Francisco. This will complete our drive across America. The Conclave is over, the 50th anniversary of the Big Healey celebrated in style. A Grand Dinner rounds off the four days, followed by the Award ceremonies. Much to our surprise both Peter and myself win a commemorative plaque for first place - me in the BT7 autocross section for ladies and Peter in the standing quarter mile - special section. What superb mementos. A lot of new friends made. One day I'm sure we will see many of them again. The over-riding memory will be the way we have been honoured for our 'Around the World' achievement. I'm so glad we came and can share some of the experiences with everyone. We set off early this morning - 5 a.m. much to Kathryn's horror, but we have a long way to go and hope to miss Friday afternoon traffic out of San Francisco. The locals say it will be tough. A great drive down the last stretch of route 50 brings us to just north of the Golden Gate Bridge. We branch off to Muir Beach and Peter and Julian celebrate our arrival at the Pacific Ocean with another paddle and a bottle of champagne. Sadly my video tape has stuck - I hope that will be sortable on return - so I cannot post a picture. On over the bridge and both Peter and Julian have to drive the wiggly Lombard Street, not just once but twice. 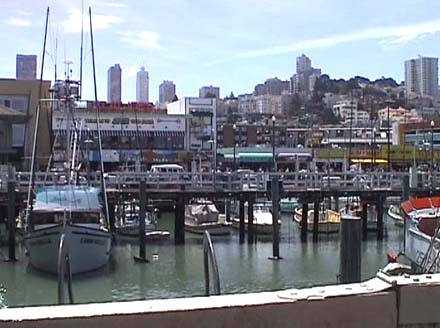 Then of course, what else but lunch at Fisherman's Wharf. Clam Chowder and Dungeness crab - delicious.